“Music Lives Here” is an inscription chiseled into the sandstone rock next to a brand new grouping of Harmony Park instruments. 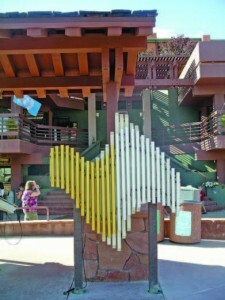 A bold installation by the city of Sedona, Ariz., these outdoor instruments are permanently placed on Main Street at the Chamber of Commerce Visitors Center to boost its public art initiative. The city approached Sedona Chamber of Commerce President and CEO Jennifer Wesselhoff about the installation. She then asked Leslie Hunt, director of the visitor center, if they would be a good addition there. Freenotes Harmony Park received approval from the city of Sedona to install two groupings of Harmony Park instruments. 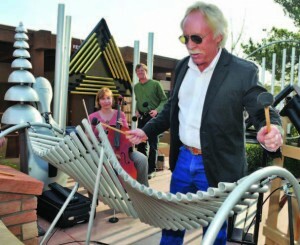 The Contrabass Chimes, Saturn’s Chimes and Manta Ray found homes at the Sedona Visitor’s Center. The Swirl, Pegasus, Imbarimba and Sunset on the Yantzee will stand at the uptown bus shelter. After the installation was complete, the chamber of commerce organized an effort to have Richard Cooke, founder of Freenotes Harmony Park, and a group of local musicians give a public performance on the instruments at the visitor’s center. The audience was so enthralled by the ensemble that they gave two standing ovations and insisted the music continue an additional 30 minutes beyond the time allotted. Sedona Mayor Rob Adams made a special visit to play the first notes of the concert and to show his appreciation. Freenotes Harmony Park is a new generation of outdoor musical instruments that combines sculptural beauty with musical integrity. Soothing tones are created through this percussion ensemble that everyone can play. Sounds are sophisticated and surprisingly delightful, making them fun and engaging for the novice or expert musician alike. Because there are no wrong notes, Freenotes ensures musical success and invites participation, bringing people back again and again. A lineup of eleven instruments including xylophones, chimes and marimbas allows even the most novice player to send beautiful notes into the world. These interactive art sculptures are located in parks, river trails, botanical gardens, schools, healing centers and, most recently, Sedona’s Visitor’s Center. Since introducing the first designs in 1996, Freenotes have become internationally recognized as an innovative musical ensemble. Through music, stronger communities are built. These sound gardens are a way for all different types of people to join in a harmony of song. To learn more visit us on Facebook or go to http://freenotesharmonypark.com/. Information provided by Freenotes Harmony Park.